According to WordStream, emails are among the top three most influential sources of information for B2B audiences. The majority of B2B marketers even claim email marketing is the most effective platform they turn to in terms of revenue generation. From a B2C perspective, email marketing is extremely effective too. Thirty percent of consumers who subscribe to an email list go on to make a purchase from the company. And… welcome Emails serve as a vital element in email marketing strategies, garnering 320 percent more revenue on a per email basis when compared to promotional emails. To top it all off? Eighty percent of retailers agree their customer retention rates are boosted more by email marketing than any other method. As you can see, your email marketing strategy serves as a core component of your company’s online success. But, if you don’t have subscribers, you have no one to send your emails to. So how do you grow a list of subscribers that are primed and ready to listen to your every word? 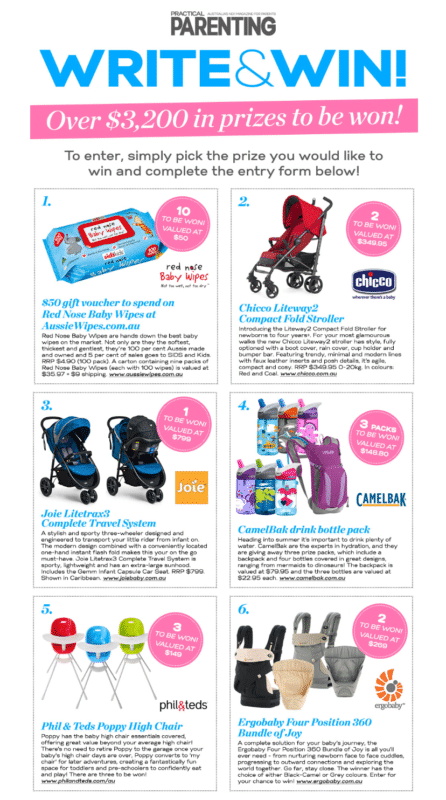 Sure, hosting a contest serves as an excellent way to grow your email list. But, on top of that, for each person who enters the contest, you are able to collect potentially revenue-generating information, including an email address, age, and other demographic data. You can use this information to personalize emails in the future. According to one Monetate study, marketers enjoy an average increase of 20 percent in revenue when targeting consumers through personalization. The design and delivery of your contest are as important as the promised prize. Ideally, you want to attract subscribers who fit your ideal buyer description and not just any random Jane Doe. Here’s a look at four contest ideas that are designed to rapidly grow your email list with the right kind of prospects. Why do people have an innate desire to share things on social media? To bring valuable content to others. Put simply: It’s in our DNA to share something because it identifies us with others and brings us closer to those we associate with. Contests are custom-built to elicit these desires, get more shares, and subsequently, convert more prospects into email subscribers. 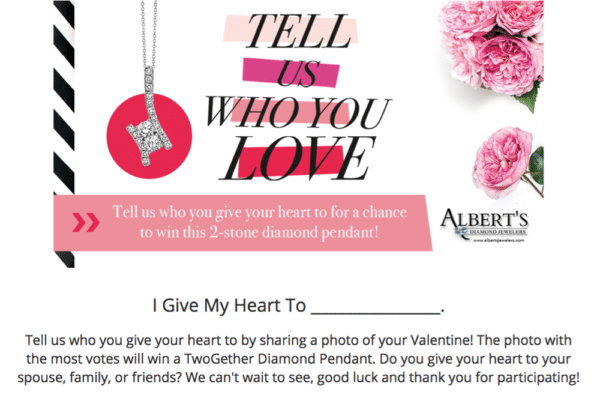 For example, Albert’s, a Diamond Jeweler, wanted to ramp up awareness and sales of their TwoGether Diamond Pendant. What better time to do so than just before Valentine’s Day, right? Participants were invited to enter a photo contest with the top prize being one of the pendants, and all they had to do was enter their contact details. Each entrant earned additional entries into the giveaway when they shared the contest on social media. Entering the contest was fast, simple, and attractive for people who were interested in this piece of jewelery. Regardless of the prize you’re giving away, simply asking contest applicants to share it as a way to earn additional entries serves as an effective way to not only grow your email list but boost brand awareness at the same time. It’s a cliche, but the “quality” over “quantity” debate is worth mentioning when it comes to running a contest to grow your email list. What good is brand awareness if it’s with all of the wrong people who will never end up being customers of your business? Sure, you want your contest to spread as far and wide as it can, but only if it gets in the hands of the right kind of people. It’s far too common for marketers to lose sight of what the real goal is … to generate warm prospects and leads that are more likely to become customers of your business. Your email list growth strategy should be designed to attract subscribers who fit your ideal customer profile. The type of prospects that pay you the most, are enjoyable to work with, and inevitably achieve success with your product or service. If you have a well-defined profile of your ideal customers you can design your contest and choose a prize that will attract similar prospects. Not all contests are created equal, and there is no “perfect” contest format. Different industries bring different prospects, interests, and online behavior. So you need to adapt accordingly. The only way to know which type of contest your ideal customers will respond positively to is to test various formats until you land on the best performing one. Photo or video contests. These are especially good for encouraging user-generated content and tapping into the power of social networks. Event-based contests. 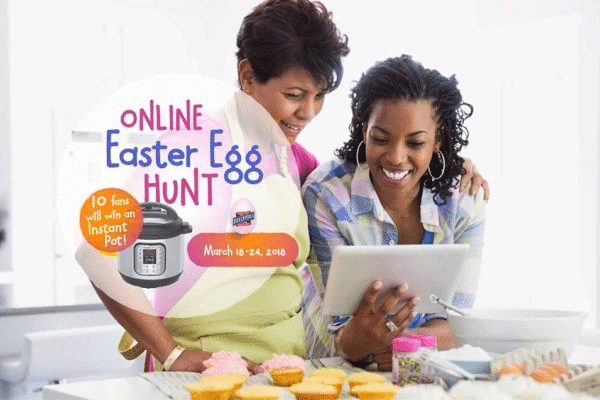 Events that occur throughout the year, such as Valentine’s Day, Mother’s Day, or Easter, are great opportunities to run a contest. Polls/pick a prize. A “Pick a Prize” contest is an interactive way to understand more about the type of prize your prospects are most interested in. Giveaways or Sweepstakes. The winner of this type of contest is usually chosen at random from a pool of participants, so everyone has an equal opportunity to win. Quizzes or Trivia. These contests take participants on a journey that depends on their answers to the questions. Do you have something unique and exclusive you can giveaway as your contest prize? People love getting the inside scoop or having “backstage” access to things that others don’t. There is just something about exclusivity that tickles our intrigue and entices action. For example, Tootsie Roll, yes the company that specializes in lollipop flavors and the classic Tootsie Roll chewy candy, released a new lollipop flavor and used a taste-testing contest to ensure the whole world knew about it. They organized a giveaway with the grand prize being the rare opportunity to be a taste tester for the new lollipop flavor. 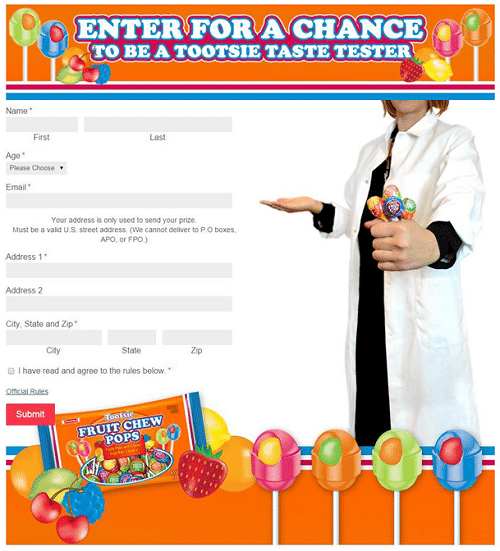 Consumers simply had to go to the contest’s landing page and enter for a chance to be a taste tester by sharing their email address, name, posting address, and age. Using Facebook to market the contest, Tootsie Roll secured nearly 44,000 entries in only three days! So, when it comes to growth, what separates the successful contests from the failures? To break it down, let’s take a closer look at a contest hosted by Josh Earl, a freelance writer and programmer. Josh clearly did something right because he was able to increase his email list by 3,418 percent in only 11 days. How did he do this? Well, it all started by offering a product that was relevant to the community and industry he provided a service to. But perhaps more importantly, he targeted people who are online all day long; this type of audience is extremely valuable when it comes to marketing and promoting a giveaway. Not only was his audience online all day, but they also had a tendency to share a lot on social media. He then boosted the sharing of his giveaway by offering subscribers additional entries for each time they shared the contest. And by using an automated drip email sequence to participants, he encouraged applicants to garner even more entries. Are laser-focused in who they target. Leverage social media to increase their reach. Offer a prize that has a high perceived value with the ideal prospects. 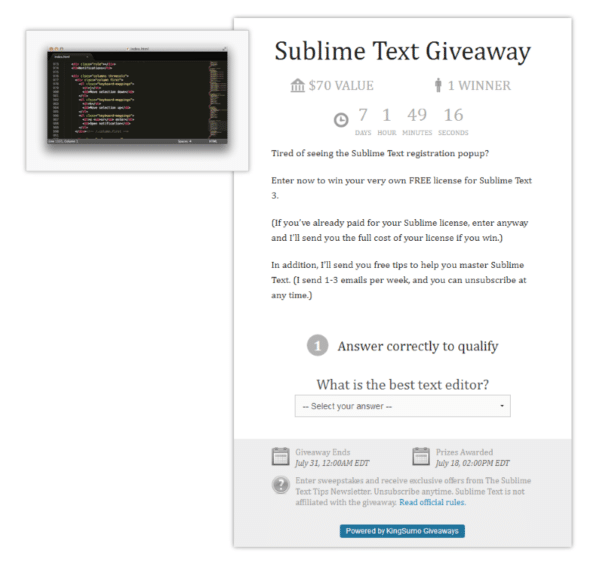 Are you ready to ramp up your email list size by running a contest?